Repositioning Cruises - what are they? Repositioning cruises happen in the spring and fall of every year. Cruise companies have to relocate their ships from cold climates to warmer ones during the winter months. Cruises in Alaska are obviously not feasible in winter! So like snowbirds (a.k.a. Canadians), cruise ships make their way down South from Alaska to the Caribbean. Then when spring comes along, the ships make their way back up North, just like the whales. 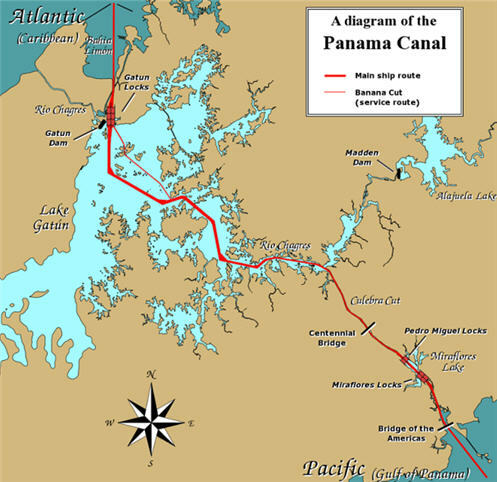 Diagram illustrating the layout of the Panama Canal. And to get to where they are going, ships have to go through the Panama Canal, through 3 sets of locks and the huge Gatun Lake. The 16-day full transit Panama Canal cruise that we took in 2005 on the Regal Princess was not officially a 'repositioning cruise' but it was similar. We sailed from Florida, stopped at a couple of Caribbean islands, then through the Canal and up the Pacific Coast and ended up in California. Why are these cruises so popular? Price is one factor: they are usually cheaper. Another factor is more sea days. We love days at sea...they are relaxing. These cruises are longer with less ports. And since we have been to most of the islands in the Caribbean, the ship now becomes our 'destination', so we don't mind being at sea to enjoy the sun, the wind and everything else that these ships have to offer. But on the other hand, these types of cruises are not for everyone. If you're a first time cruiser (or even 2nd and 3rd time cruiser), you'll enjoy more a 7 day cruise with at least 4 or 5 ports to visit. Or if you have kids and teenagers, a cruise visiting many islands will make it more interesting for them. Also these are one-way routes, so you'll be flying in one city and out another one far away. You'll have to figure that into your budget when looking for one-way or open-jaw flights. The Alaska cruise season starts in May, so the ships will be making their way North in April and early May and in reverse in the Fall. Looking for the Best Family Cruise?